One of the best things about writing a blog are the e-mails you get from people you would ordinarily never meet. They can range from the famous, such as Tommy Chong or Olivia DeHavilland, to some contemporary authors and my main stock in trade, the ordinary reader. And all are of equal interest to me. I love the feedback. 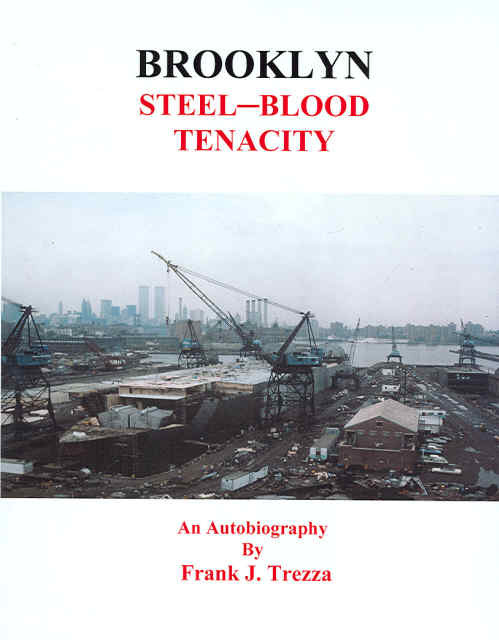 So, when I got an e-mail about the Brooklyn Navy Yard from Frank Trezza, I was immediately interested in what he had to say. 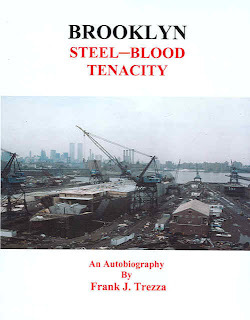 Mr. Trezza is the author of the book "Brooklyn Steel - Blood, Tenacity" which deals with the Brooklyn Navy Yard and it's struggle to survive the turbulent decades of the 1960's through the last days of the 20th Century. These are the decades in which shipbuilding took many great blows in an industry that harkens back to Colonial Days, when American made wooden ships plied the waters of the world, forging our new nation into a global trading partner. At the end of the Second World War, there was no "bigger dog on the block" than the United States. We had just saved the world from a couple of brutal dictators and established Democracy in corners of the earth where it had never existed before. In New York, at the 23rd Street Pier, sat the SS John Brown, a World War Two Liberty ship that served as a Maritime High School. My father graduated from her in 1948. Mr. Trezza would graduate from the same ship in 1971, as a Marine Electrician, intending, as did my father, to go to sea. Unexpected circumstances diverted them both from their courses. In the case of my father, it was love which intervened. Having met my mother the year before he graduated from the Brown, he had a decided change of heart concerning leaving my mother alone. And she would not marry him if he went to sea. So that was out. In Mr. Trezza's case it was economics which kept him from shipping out. By the time that he had graduated from the Brown, American shipping had declined drastically, as it would through the 1980's. Shipbuilding was still an option, so Mr. Trezza took a job as an Electrical Engineer at the Brooklyn Navy Yard. The two main employers for shipbuilding there were Coastal Drydock, which handled the refit of my ship, the USS Milwaukee, and Seatrain, the company which hired Mr. Trezza. The author recounts the days of working there in great detail. While recalling the constant safety violations, lack of proper equipment, Union goons who track the "bathroom" breaks of the employees, hazardous working conditions and local politics, Mr. Tezza has also written a vivid account of what it is like to raise a family while working under such harsh conditions. In the effort to gain work at competitive prices, all pretense of safety and accountability are thrown to the wind by the shipbuilders, as well as the Unions, who are determined to keep the jobs in place that ensure the easy flow of Union Dues to the fat cats who sit at the top of the pyramid. As a former memeber of the National Maritime Union, I can identify with the frustation that comes with the realization that you have been paying dues to the very people who are doing their level best to forfeit your job. By the time I entered the dry dock in the Brooklyn Navy Yard for repairs in 1980, I was already familiar with the grounds, having been there with my father during the 1960’s. He was like that, taking the odd drive and showing my brother and I the different aspects of the city. We roamed the Fulton Fish Market, which at the time was completely worn down and decrepit. We wandered Battery Park when the remains of the old Castle garden were still there, and rode the Staten Island Ferry, climbed the Statue of Liberty and the Empire State Building. But nothing captured me like the aura of history surrounding the Brooklyn Navy Yard. From 1801- 1966 this was the place where many of the great ships had been repaired prior to returning to sea duty. It was also the birthplace of countless other vessels, among them the hundreds of "Liberty Ships" that helped to win the Second World War. Located in Wallabout Bay, opposite lower Manhattan, this was where the Battle of Brooklyn was fought. The bay was where the British held Yankee prisoners aboard “prison hulks”, ships that were derelict and filled with rats and vermin. Most of the prisoners never left the “hulks” alive. Be sure to reference the Brooklyn Historical Society-Seatrain Collection. Mr. Trezza is currently working to establish a Museum, within the Navy Yard, that will showcase our skills,and history as Americans, of building ships; as well as to cast light upon the political weaknesses and calculated business moves, that came to desroy a once thriving industry. His story is a fascinating tale about one man's struggle to deal with it all, while still putting food on the family table.